I took the kids to an alligator farm and petting zoo. Being so close to the alligators, I decided to try some close-ups. To do this, I mounted my Sigma 70-200mm zoom to get as close to the action as possible. I wanted these pictures to look like they were taken in the wild. Inside a building there is an enclosure of baby alligators that you can hold and feed. They were all stacked up on top of each other looking at the people, expecting food I guess. So I zoomed in close to get their heads and not include anything that looked like the enclosure they were in. 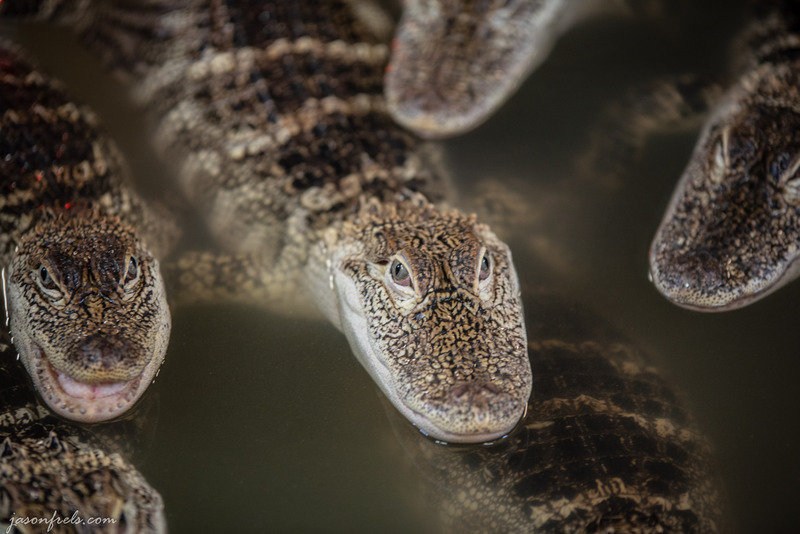 I tried to focus on the eyes of one alligator and then compose my shot. The below photo shows a close-up of a few of them looking at the camera. They weren’t very big yet and you could easily hold one in your hands. A big challenge here was shooting in a dark environment. Even with the lens at its widest aperture of f/2.8, I had to bump the ISO up to 1600. And even with high ISO, the shutter speeds are a bit slow and their eyes aren’t completely sharp because of camera movement. 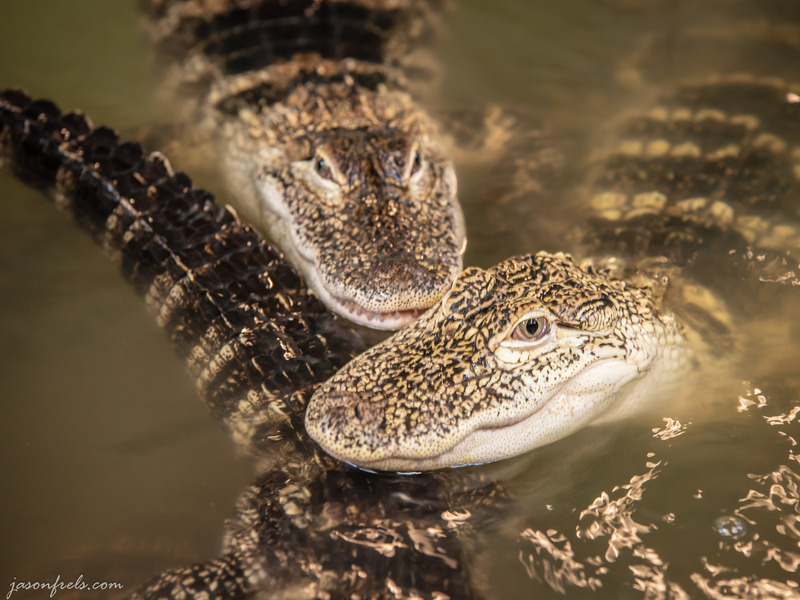 You might see a red spot or two on the left alligator as it is reflecting light from a red heat lamp in the background. The image below shows one of the youngsters in a profile view. They do have a natural sinister look about them, even when they are young. Some of the kids were feeding them chunks of hotdogs on a stick. The above was shot at 200mm and 1/20s. The general rule for minimum shutter speed while hand-holding is one over the focal length, or about 1/200s in this case. So, I was shooting more than 3 stops slower than this. The lens has vibration reduction, which should get you a stop or two and this helped, but the alligator eyes aren’t tack-sharp. I could have bumped up the ISO even more, but I really didn’t want to go above ISO1600. At ISO1600, the pictures are pretty clean with just a tiny bit of noise if you go looking for it. When I got outside, there was plenty of natural light and some large enclosures of adult alligators. I worked around the fence a bit, trying to find an isolated alligator in good light. Most of the alligators were grouped together under a tree, but there were a few hanging out in the water. I managed to get this guy with his head in the sunlight, but the rest of his body in the shadow of the tree. His head really stands out well against the dark water. When I moved outside into bright sunlight, I should have dropped the ISO back down. For some reason I didn’t think to do that, but the image is not really noisy. It is at high ISO and low light that you really start seeing noise. 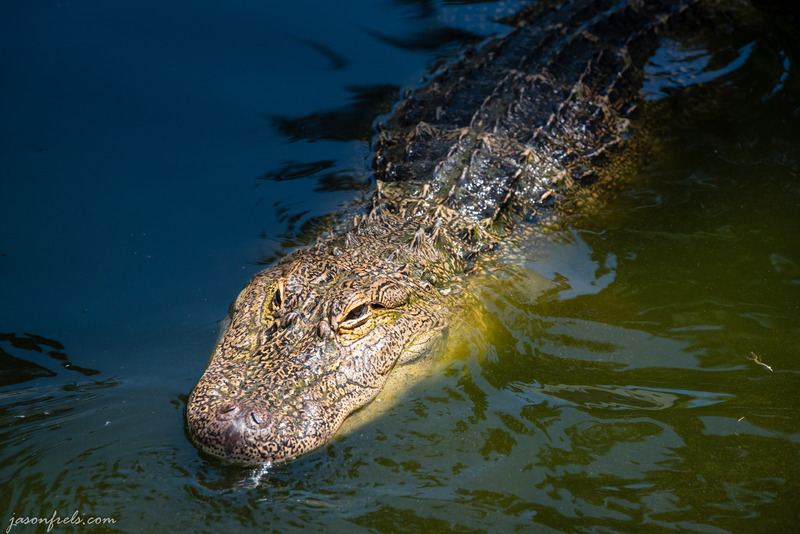 I was able to use a really fast shutter so hand-holding 200mm was not a problem and the alligator’s eyes are very sharp. Also, the colors are a bit more natural with sunlight. I tried to warm up and adjust the indoor photos, but I couldn’t get them to look as natural as the outdoor shot. These photos were taken at the Arkansas Alligator Farm and Petting Zoo in Hot Springs Arkansas.